We are very excited that Pope Francis will be “gracing” us with his presence in the beautiful City of Philadelphia. Just in case any of our BCA Members were missing out on the ever changing news, we decided to compile a few helpful links that we’re using to track the Historic Event! 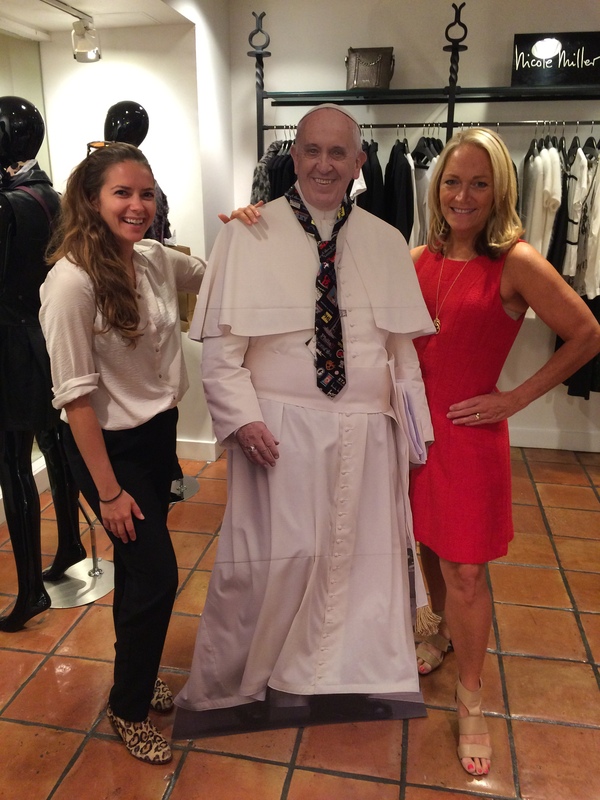 Mary Pat, Lauren and the one and only Pope Francis at Nicole Miller (#OpenInPHL) in the Bellevue Hotel. UWISHUNU highlights the “goings on” in Philadelphia. AND for fun, here is the #PopeInPhilly page so you can see some real time highlights and photos about Pope Francis and his visit to our Amazing City. As well as, #OpenInPhilly where business’ can highlight their Papal Visit hours or status. ENJOY! The BCA Team was very excited to get a chance to help paint the Mural Arts of Philadelphia project that will be dedicated in honor of Pope Francis’ visit to Philadelphia. The Papal Mural will be located at 1012 W. Thompson Street, the future home of the Saint Malachy School. We also walked center city with our tour guide learning about many of the beautiful works of art that grace the building walls. Philadelphia is a “city of murals” with over 2,000 murals and works of public art inside the city limits.